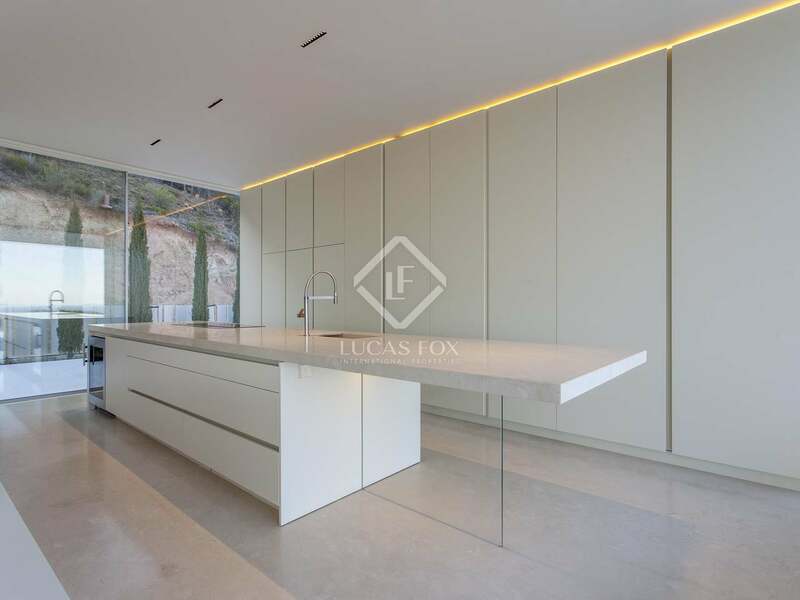 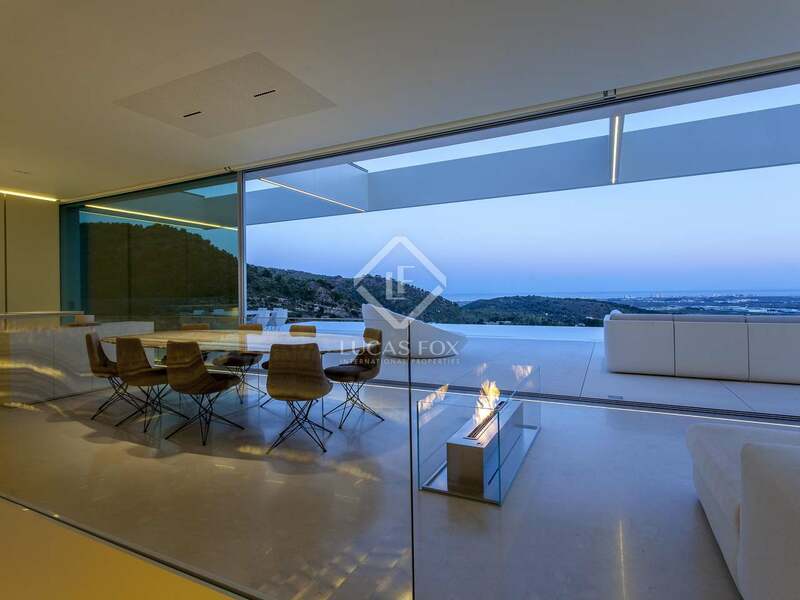 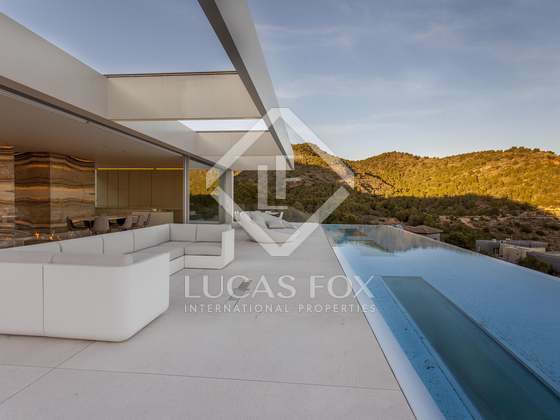 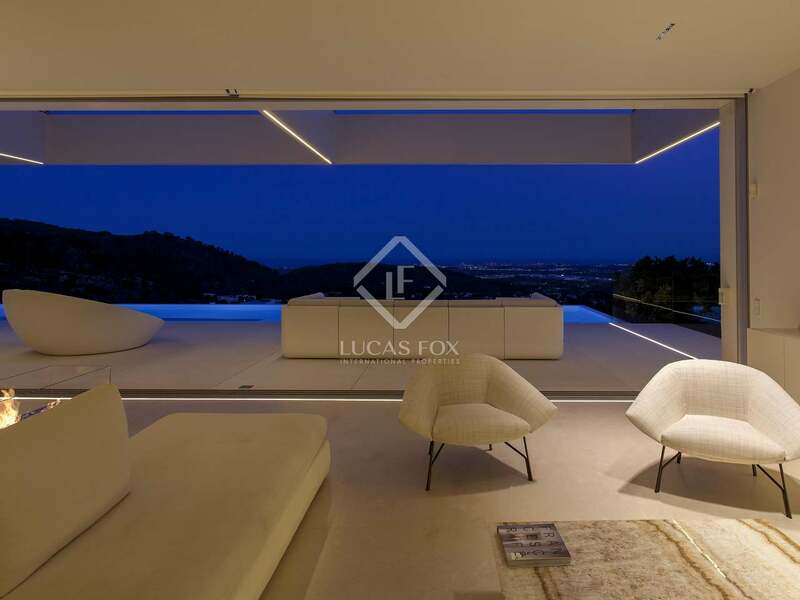 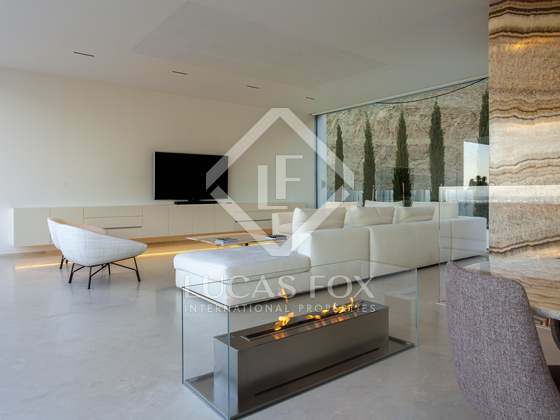 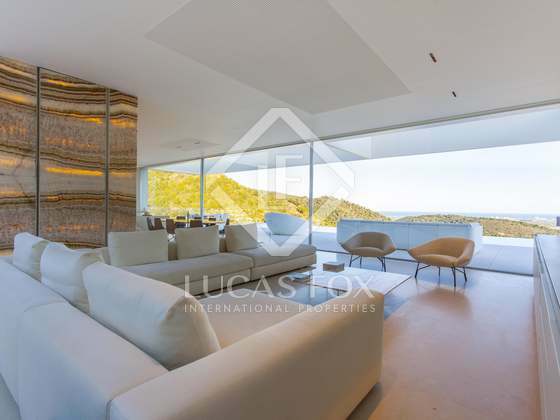 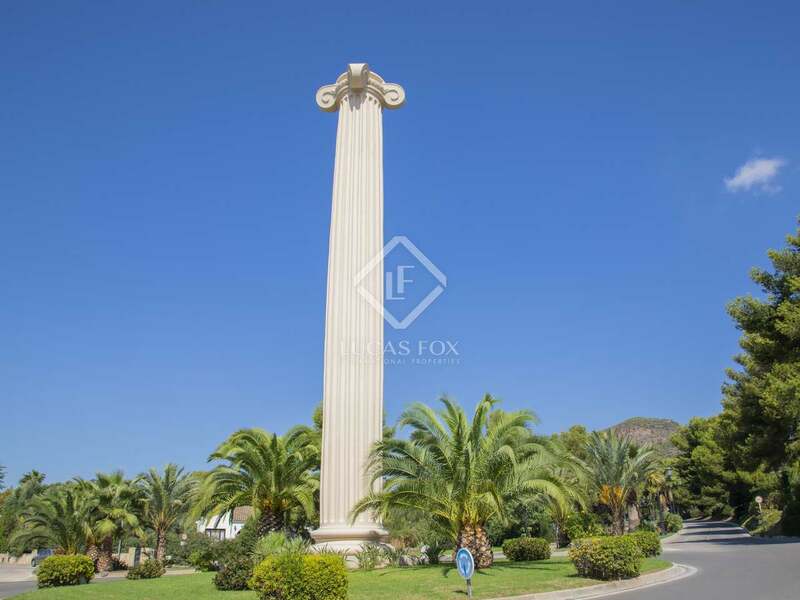 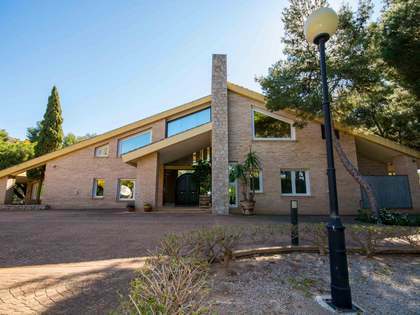 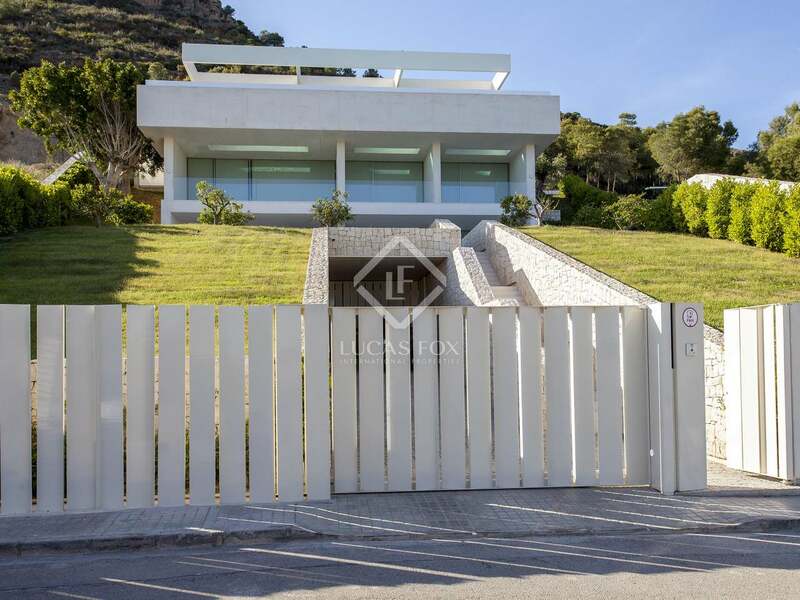 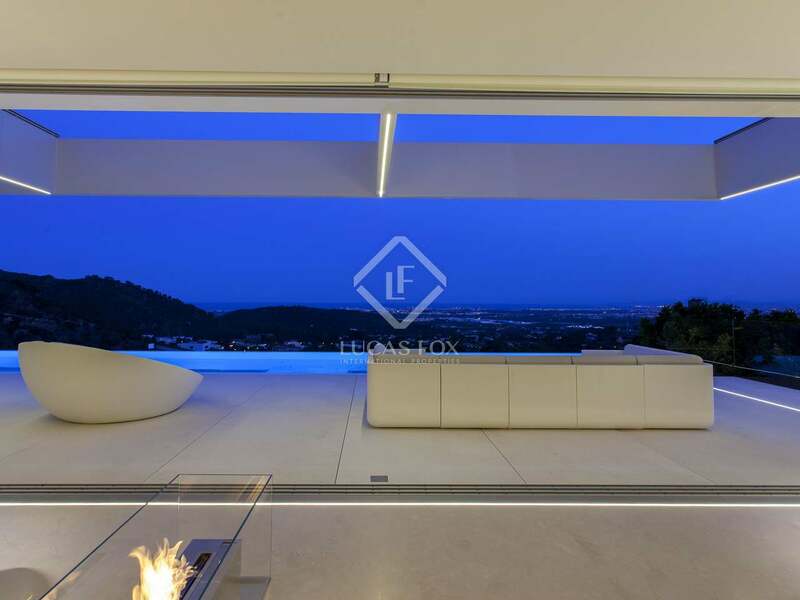 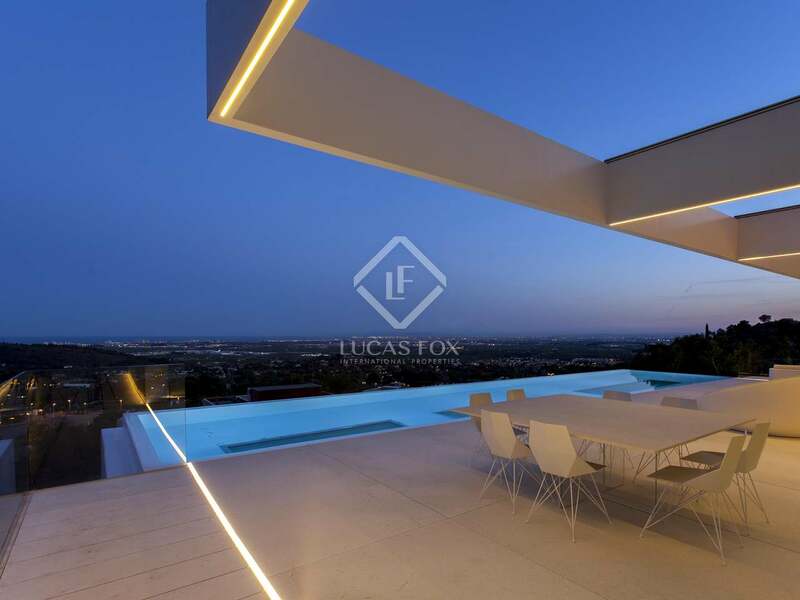 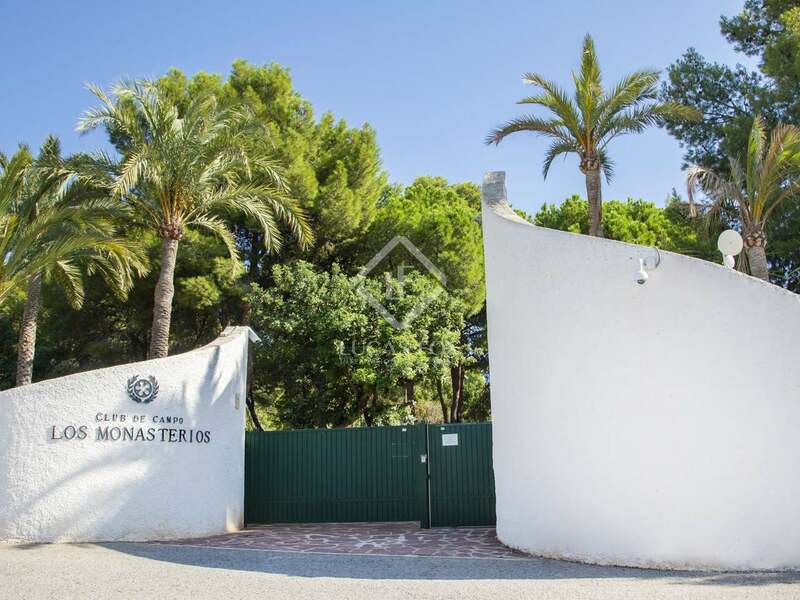 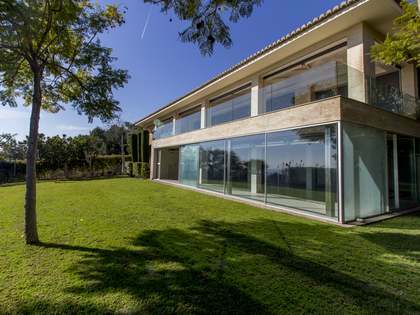 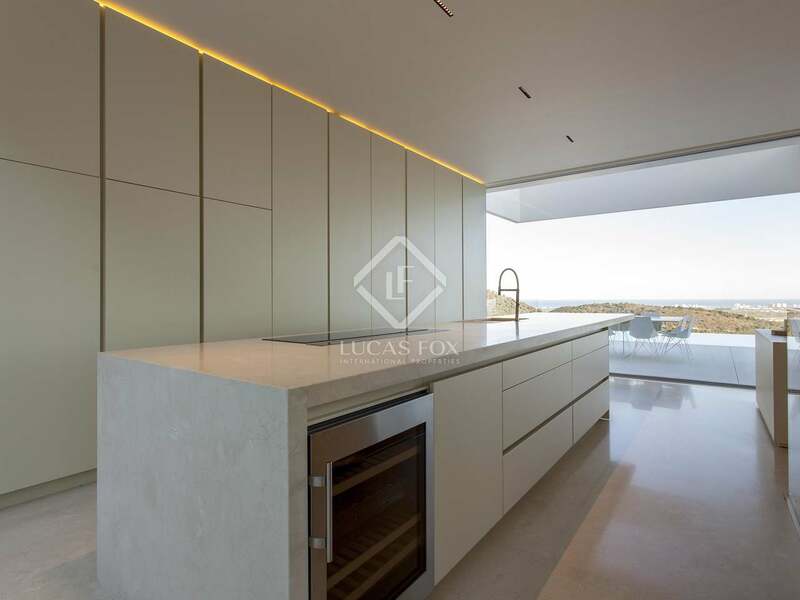 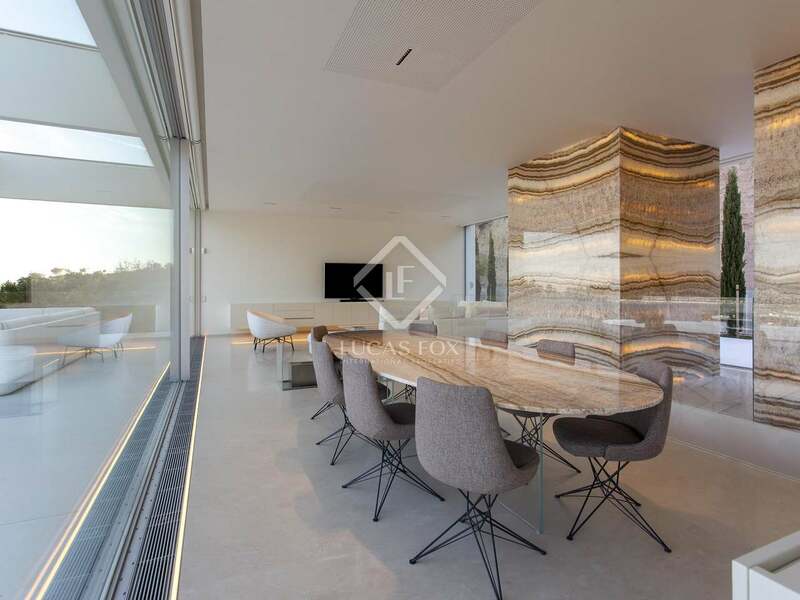 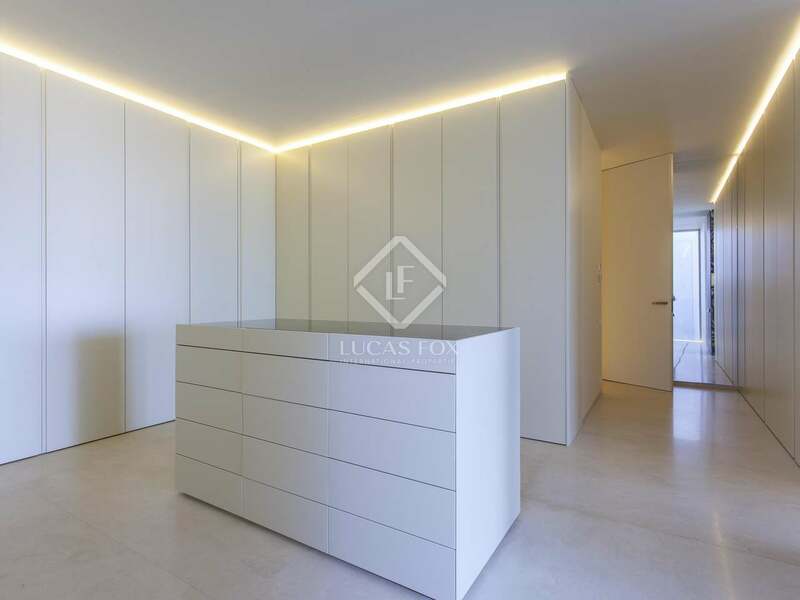 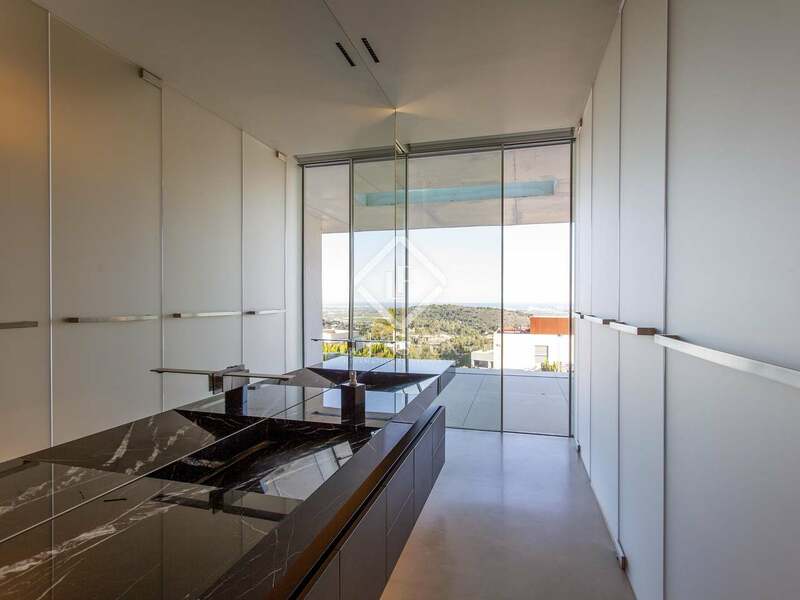 Spectacular property with spaces that open up to the sea and the mountains through large windows, located on top of a hill with the best position for views of the Gulf of Valencia. 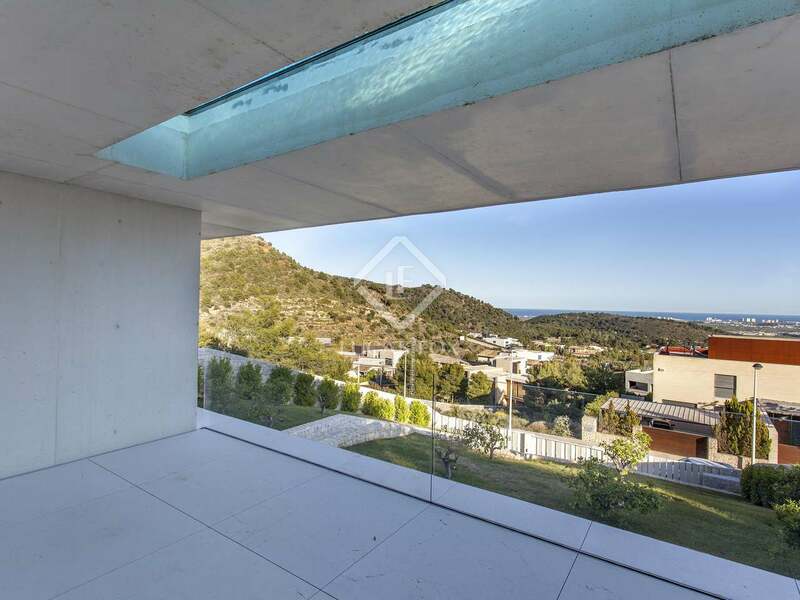 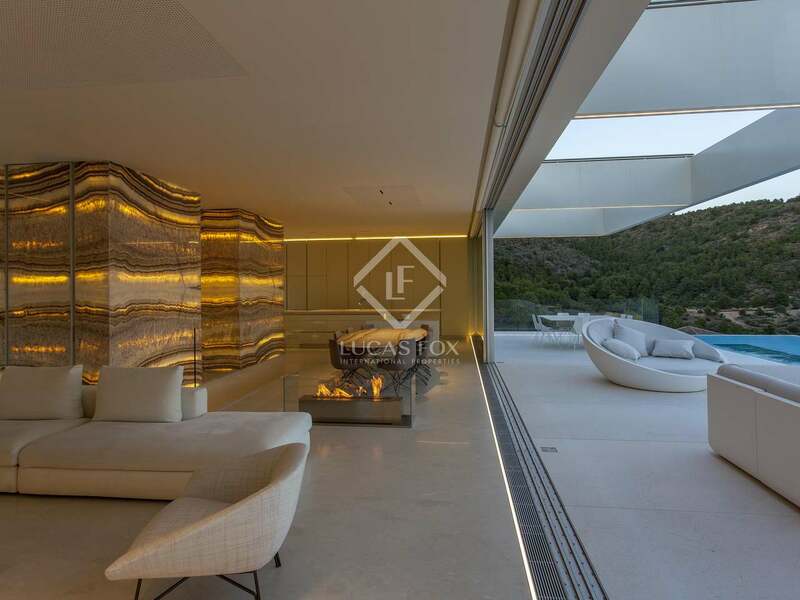 This house, with powerful contemporary features that unite nature and design, enjoys an idyllic location between the sea and the mountains. 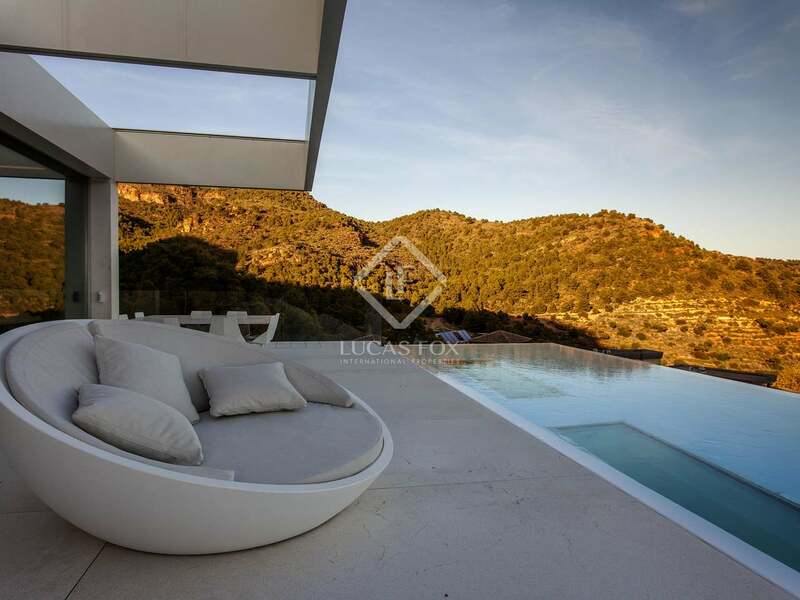 It is perched on the highest point of Monasterios, overlooking the Mediterranean landscape with its brilliant blue sea and sky. 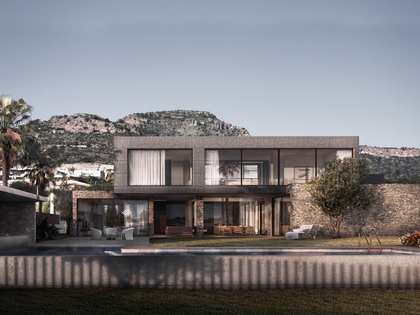 The house has been installed in a natural way, linked to the land by vegetation and its cream-coloured walls. 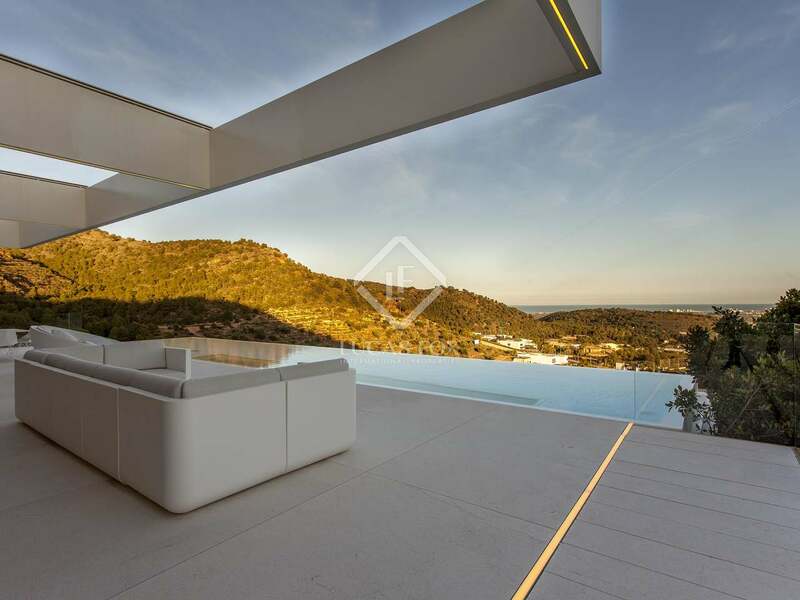 The different levels rise vertically along the slope and the terraces are like horizontal platforms that enhance the panoramic views towards the horizon. 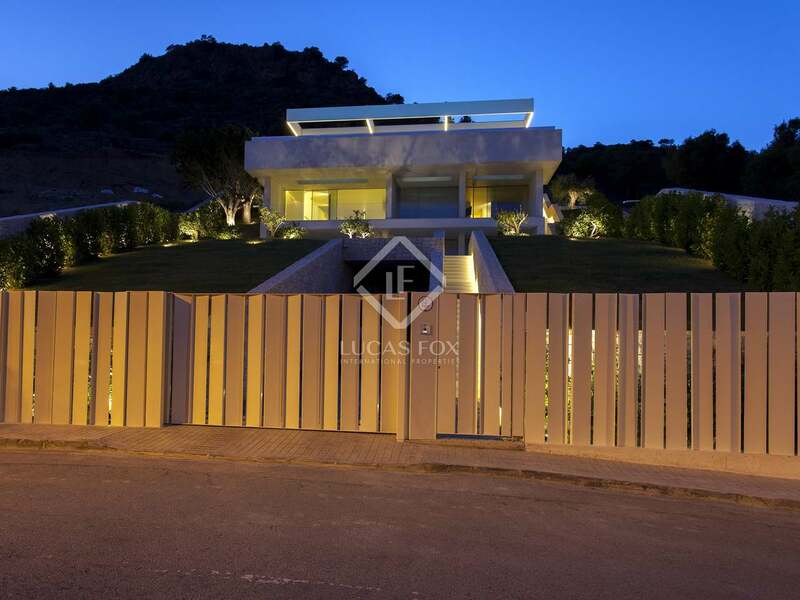 The house has been built with unique materials. 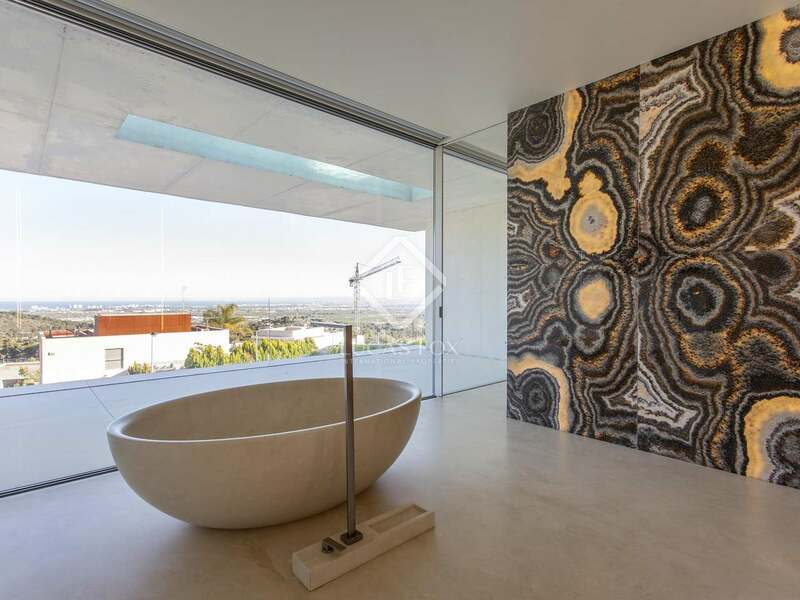 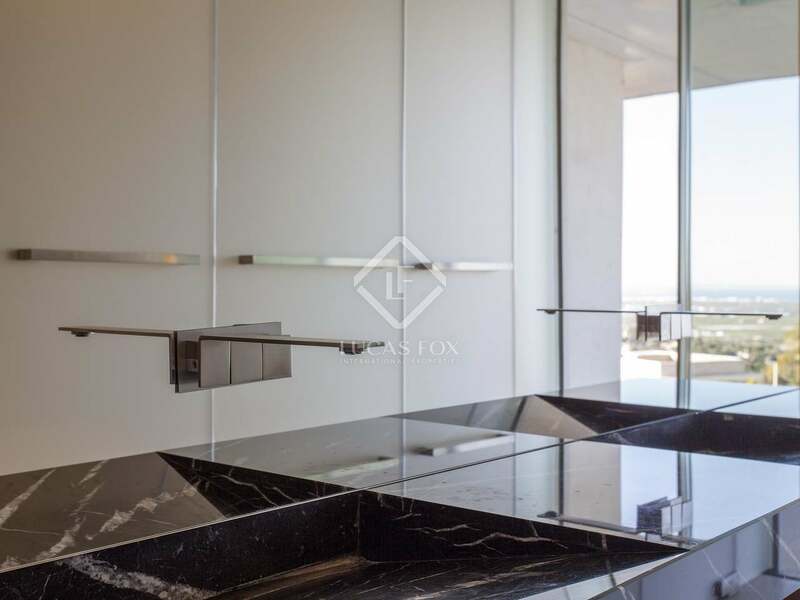 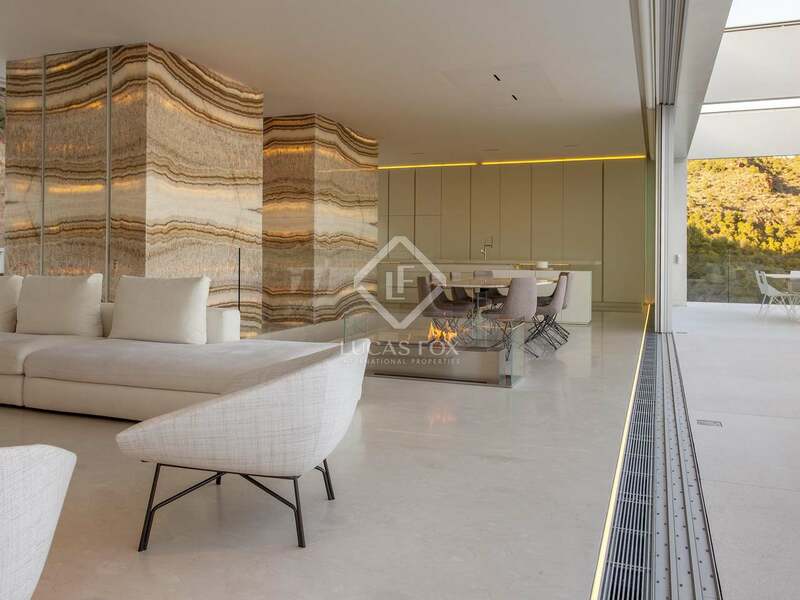 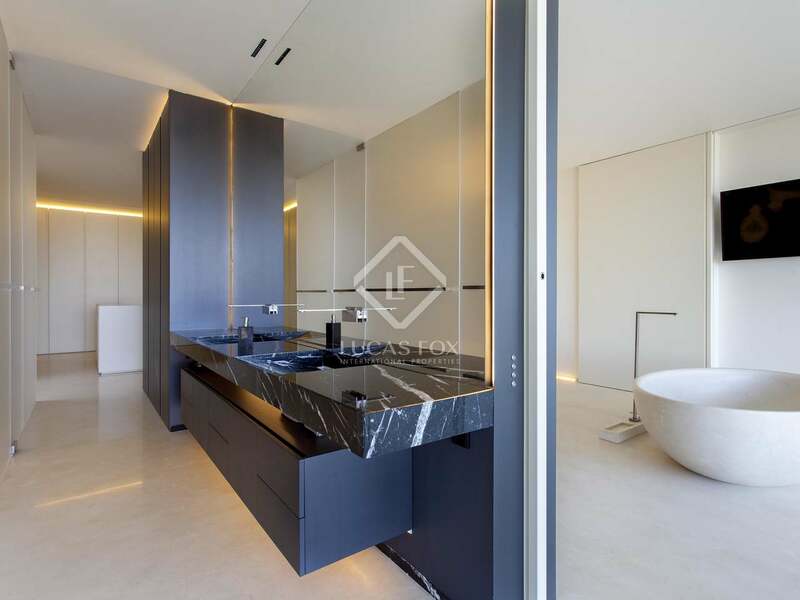 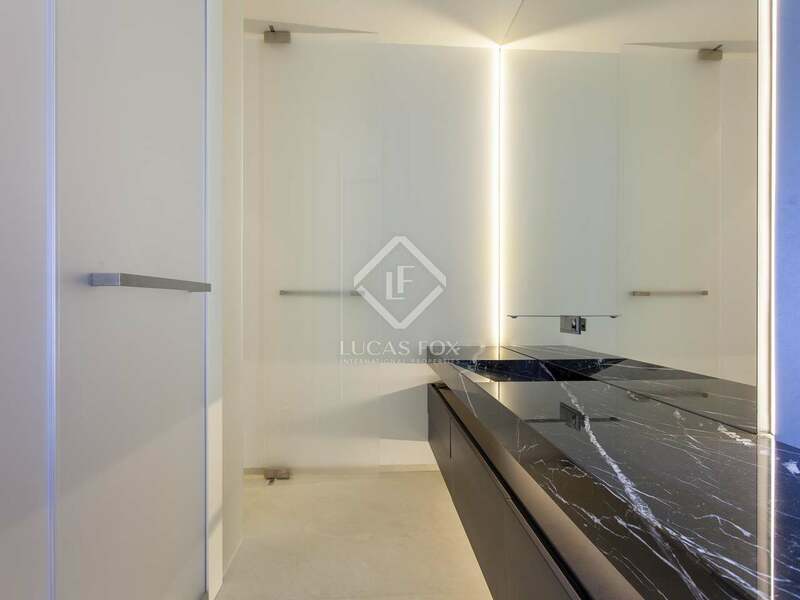 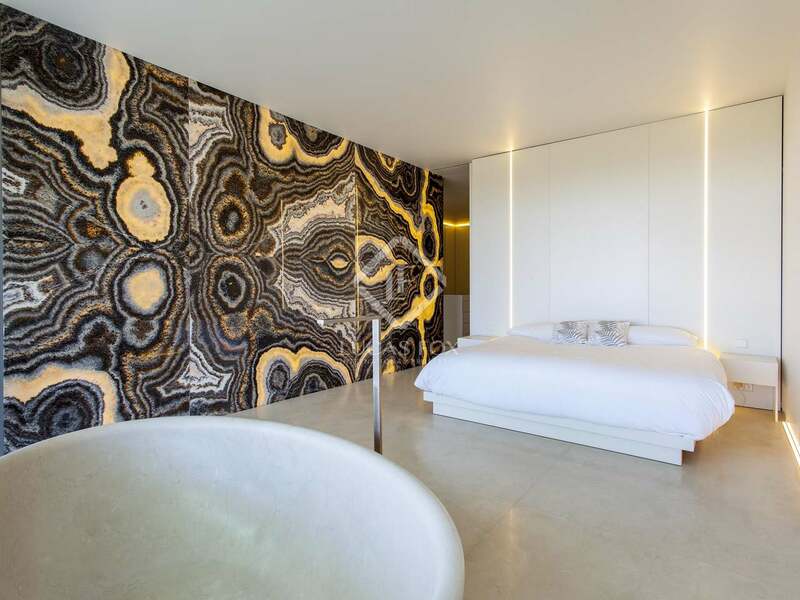 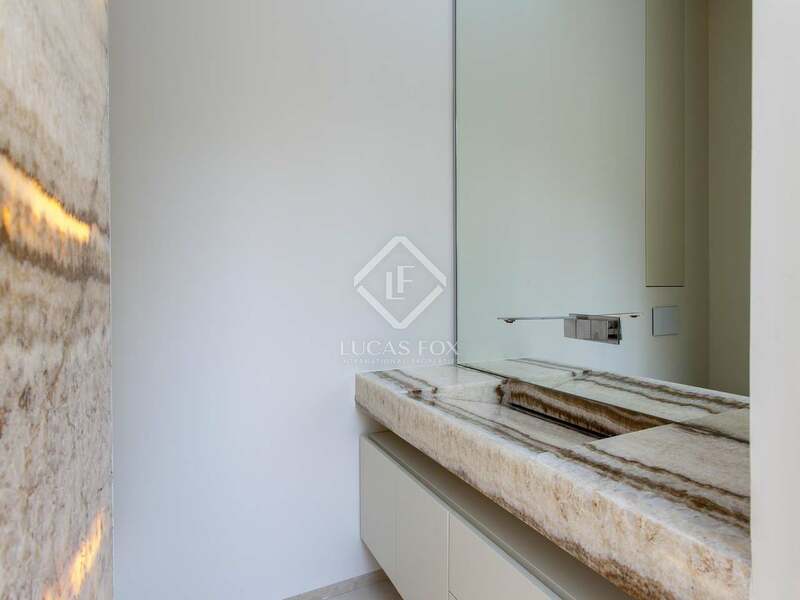 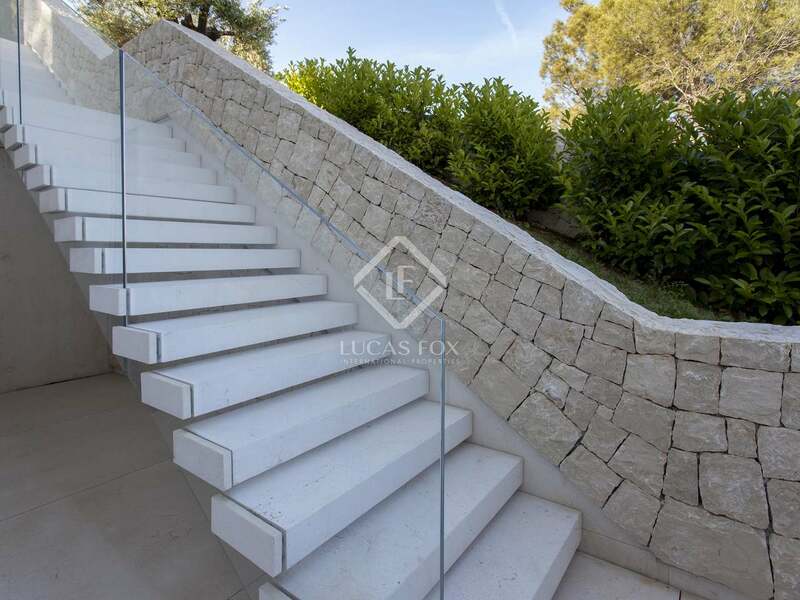 The landscape along with the building material is the basis of the project: rock at the base, and onyx and marble in all its versions in the air. 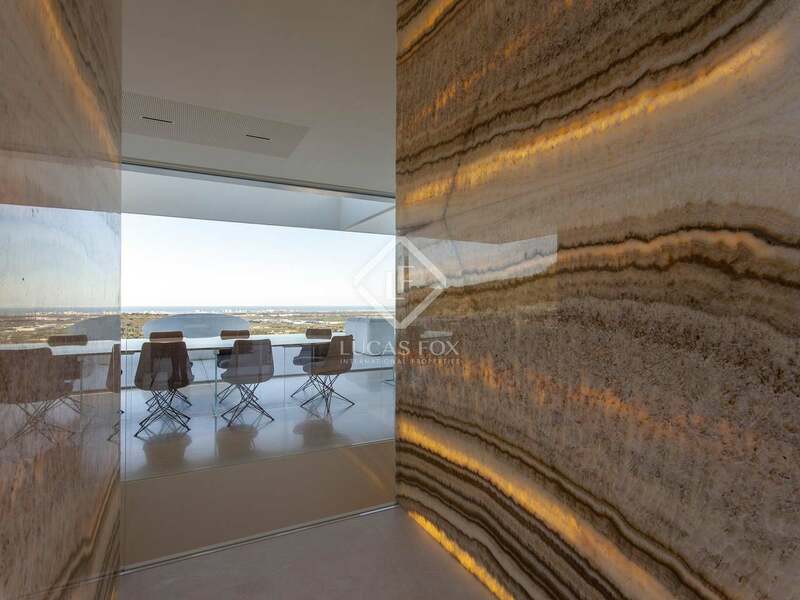 The walls are almost like amber, with a honey gold colour that creates an elegant and natural atmosphere. 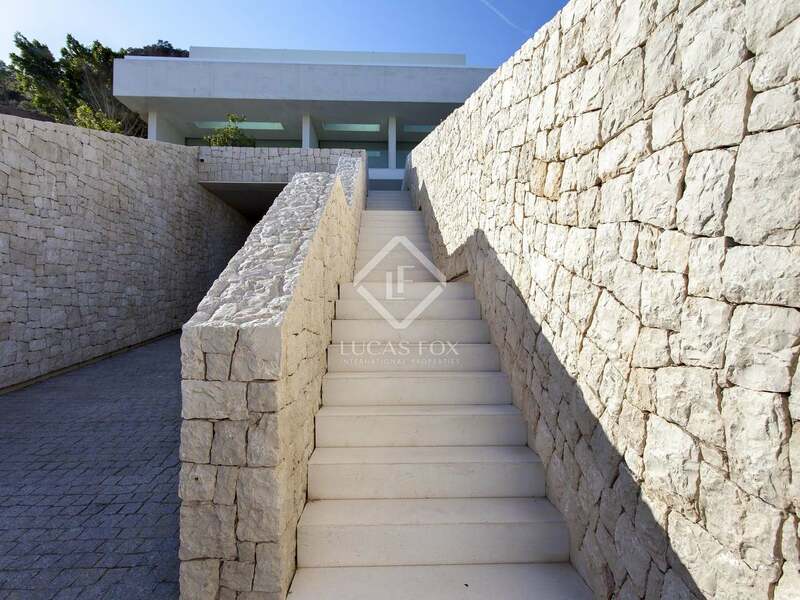 The house is accessed from the lowest part of the slope. 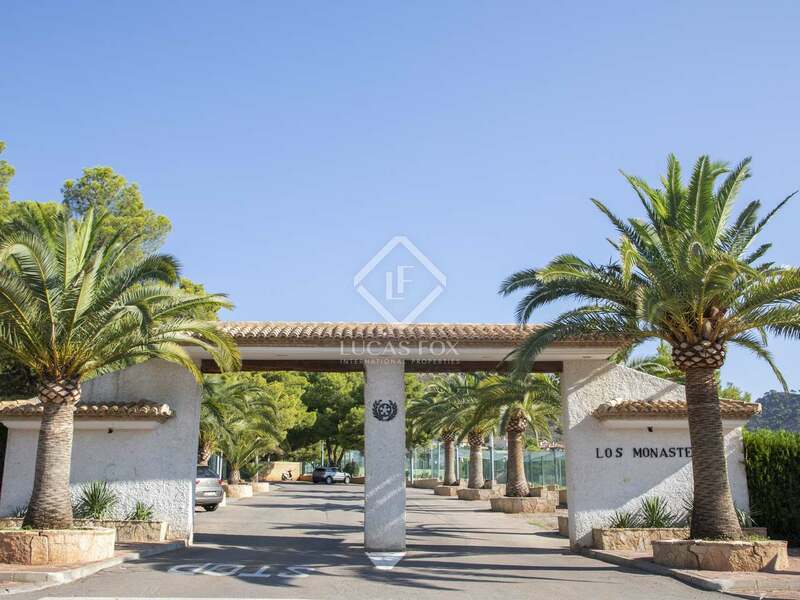 It is a classic entrance with a large gate, a central path and two symmetrical strips of vegetation. 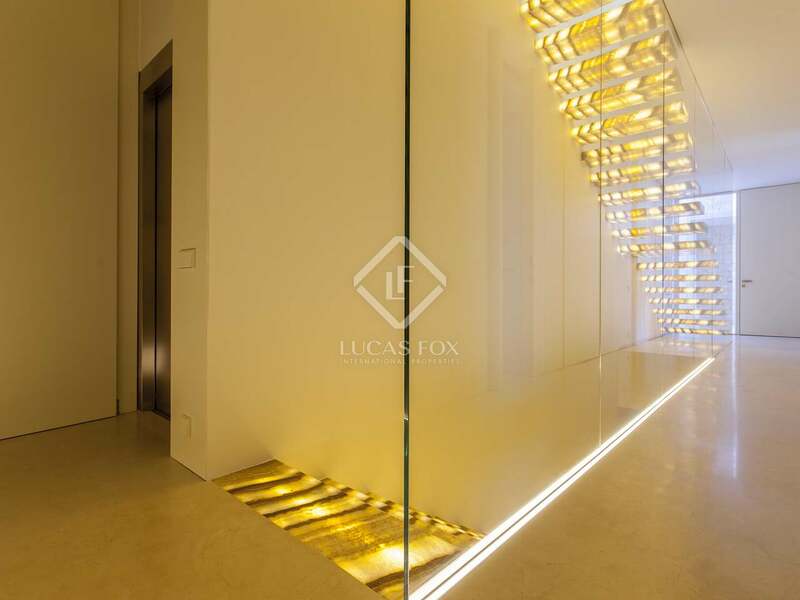 On this lower level is the parking area which is completely linked to the slope. The three upper levels unfold from the hillside and are completely exterior facing so that the spaces extend towards the landscape through immense glazed surfaces and large open terraces. 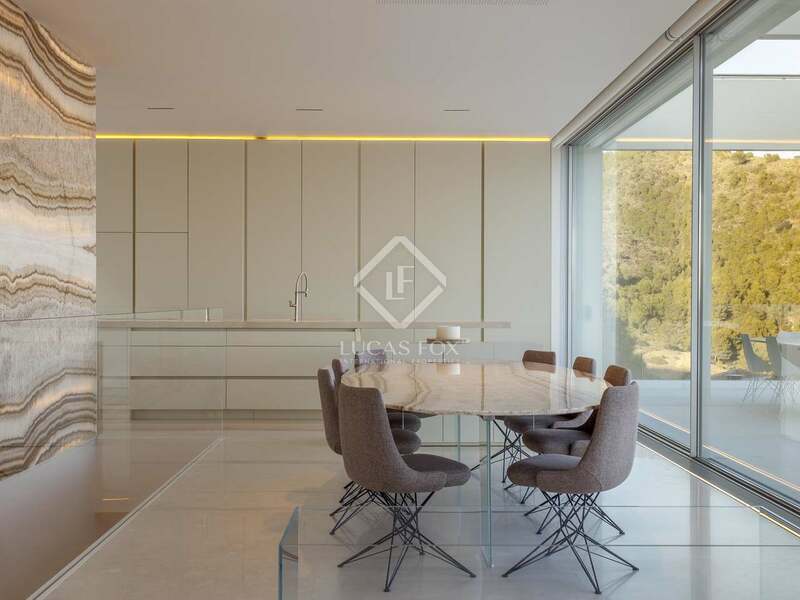 On the upper level, we find the day area, in the form of a continuous, flexible and multifunction space, with a living room, dining room, kitchen and two small zones in the centre, which comprise a toilet and a lift. 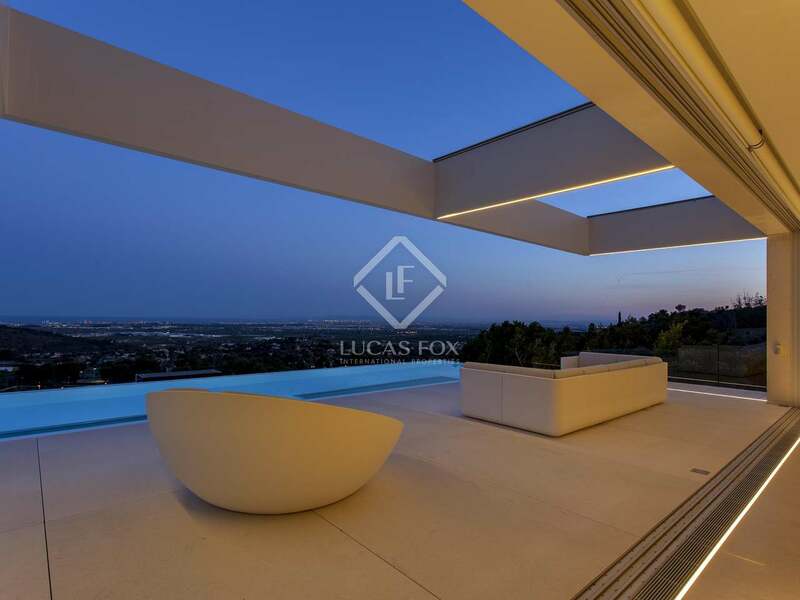 This unique space doubles in surface when taking into account the adjacent terraces with views that extend out over the landscape. 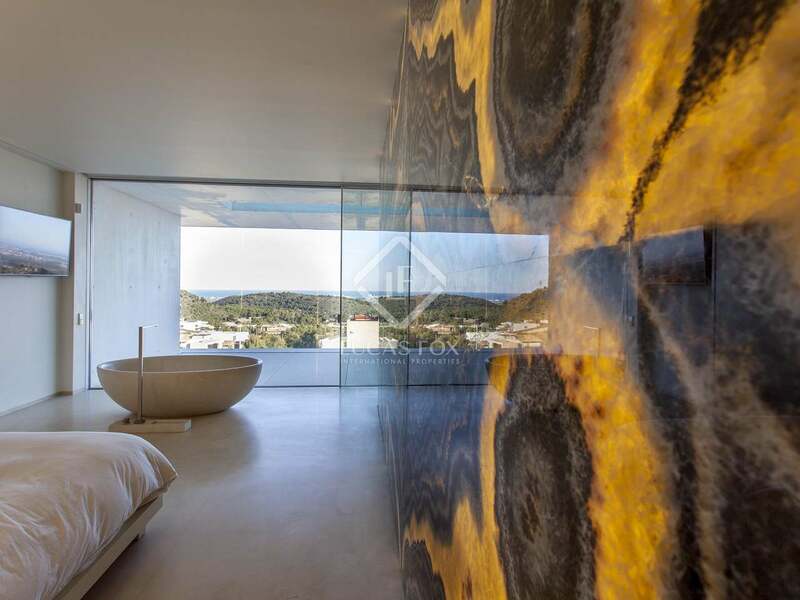 It is an almost infinite space that floats in the sea. 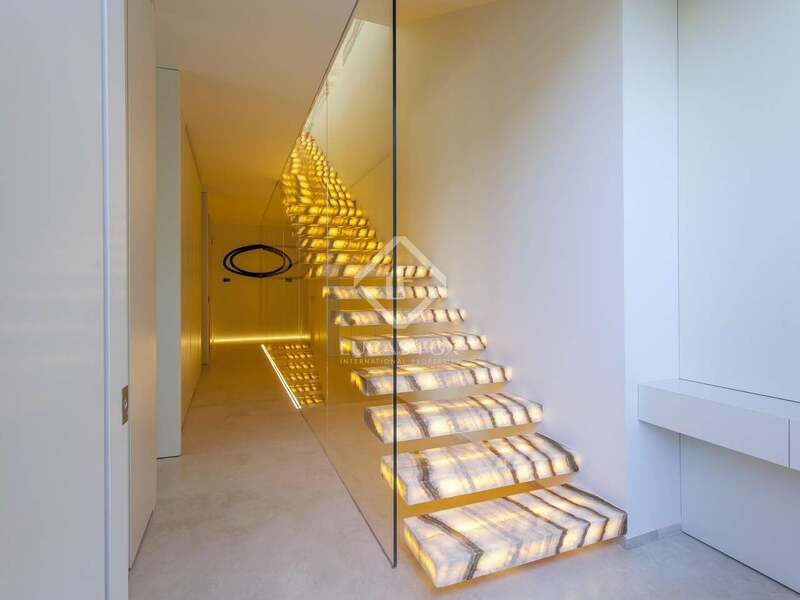 The level is completed with a work of art: the staircase. 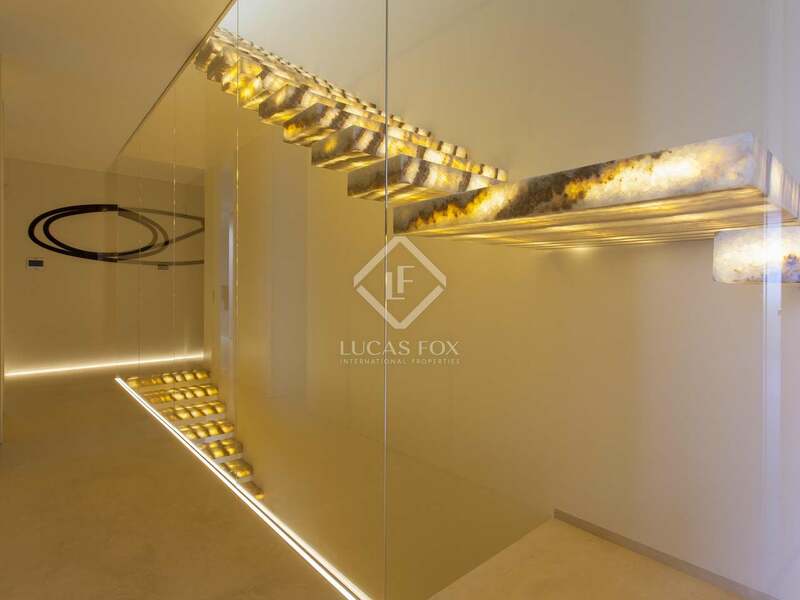 The piece creates an elegant and magical atmosphere. 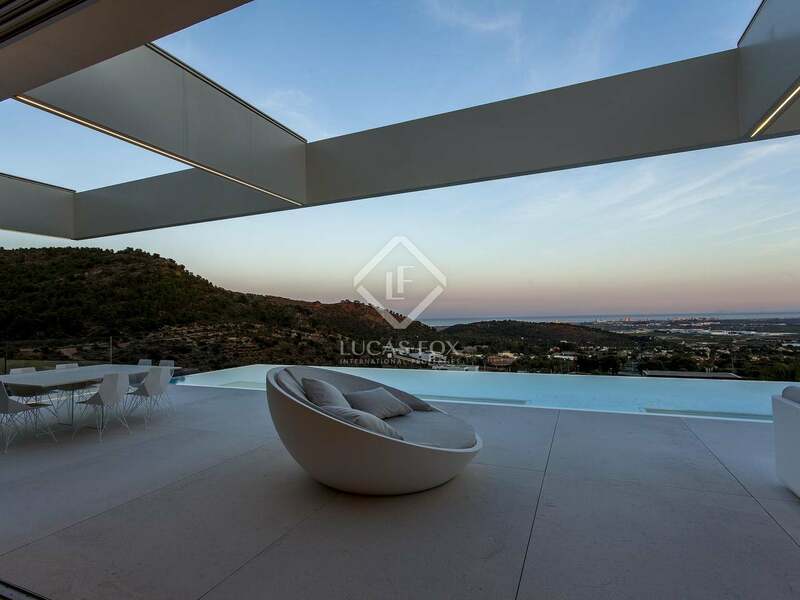 The incredible terrace is delimited and protected by a large pergola, open to the sky or covered with perforated textile. 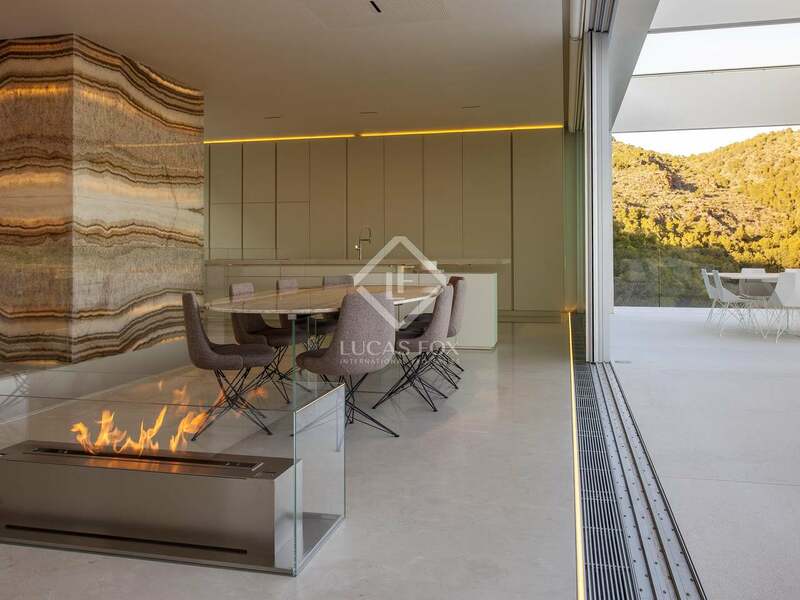 It also has an outdoor fireplace and, a unique gem, the infinity pool with a transparent floor that projects its reflections on the lower floor. 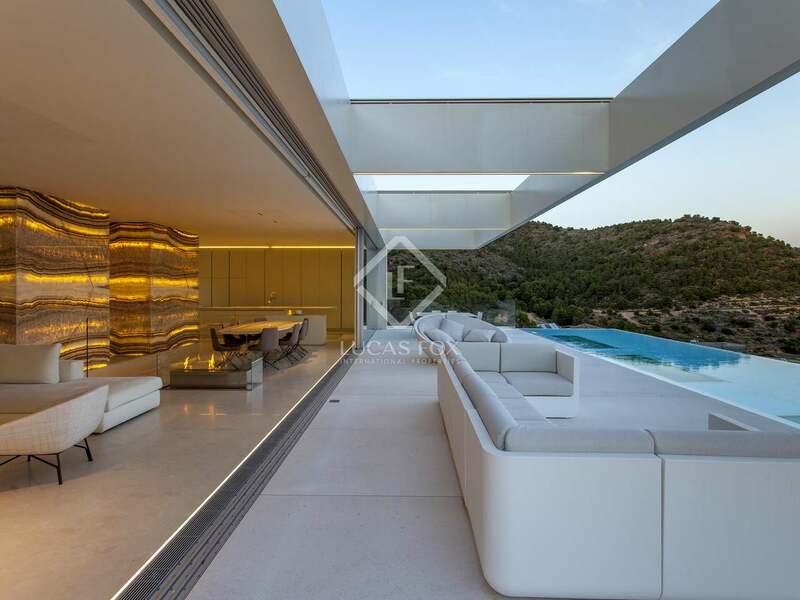 The Mediterranean landscape surrounds the terrace. 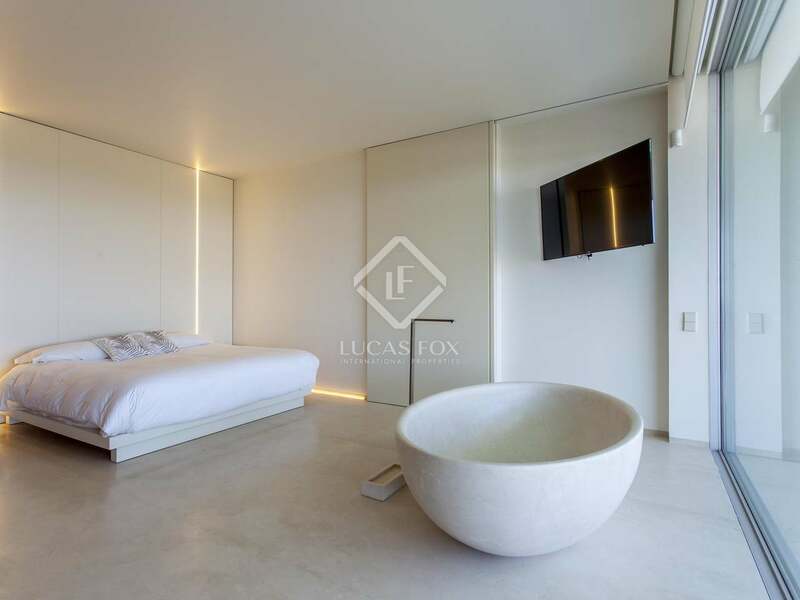 The two lower levels are very similar: rooms with private bathrooms and a gym. 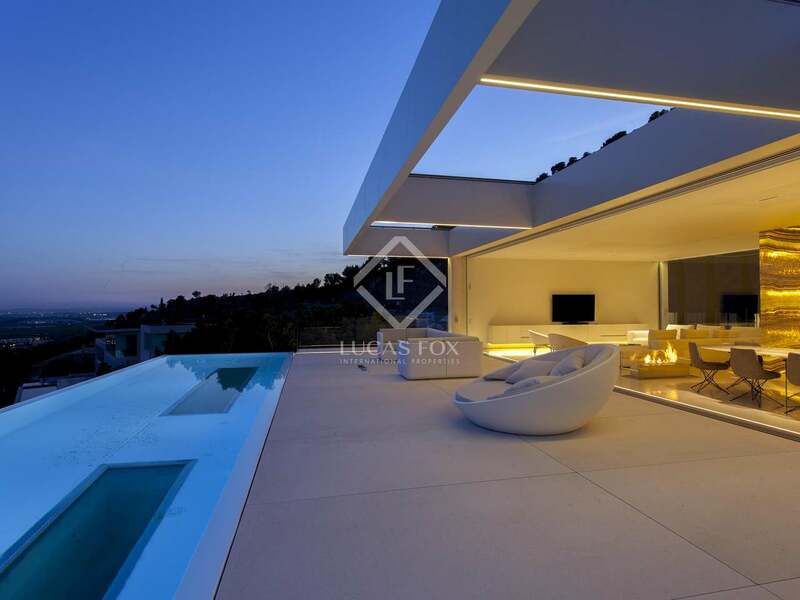 All with terraces and views. 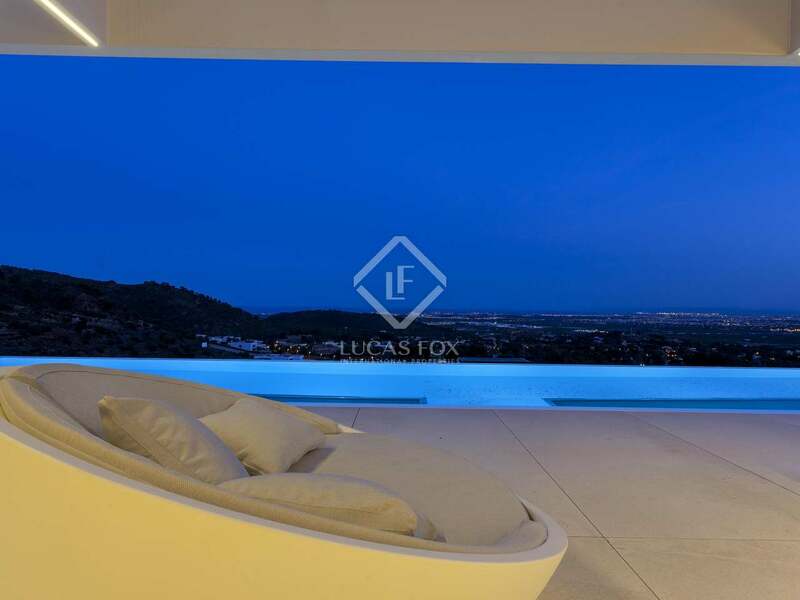 On the middle floor we find the 3 family bedrooms with similar design and views. 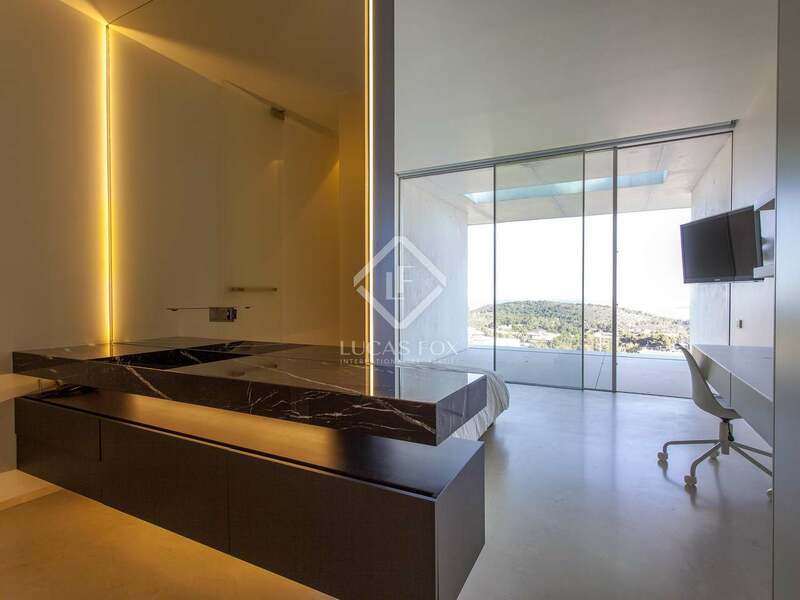 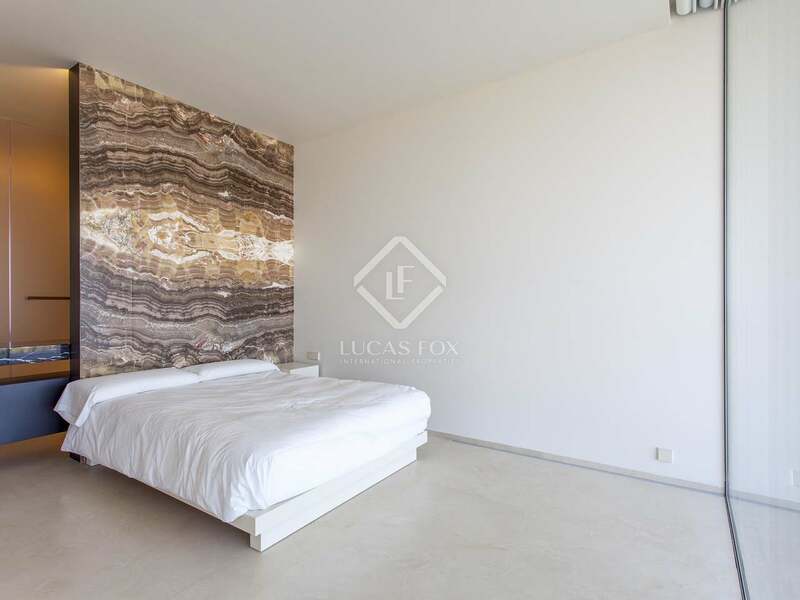 Noteworthy features of the master bedroom include its sheer size and the spectacular illuminated marble pattern. 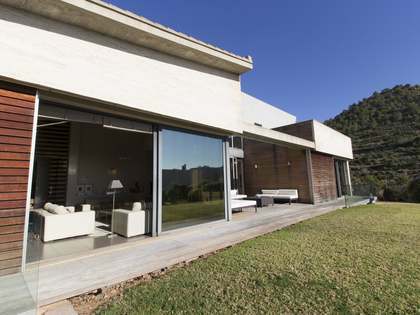 We also see great attention to detail in the gardens, lighting and enclosures of the plot. A unique home with outstanding design, materials and location: an authentic refuge characterised by the mixture of its golden reflections with the deep blue of the sea. 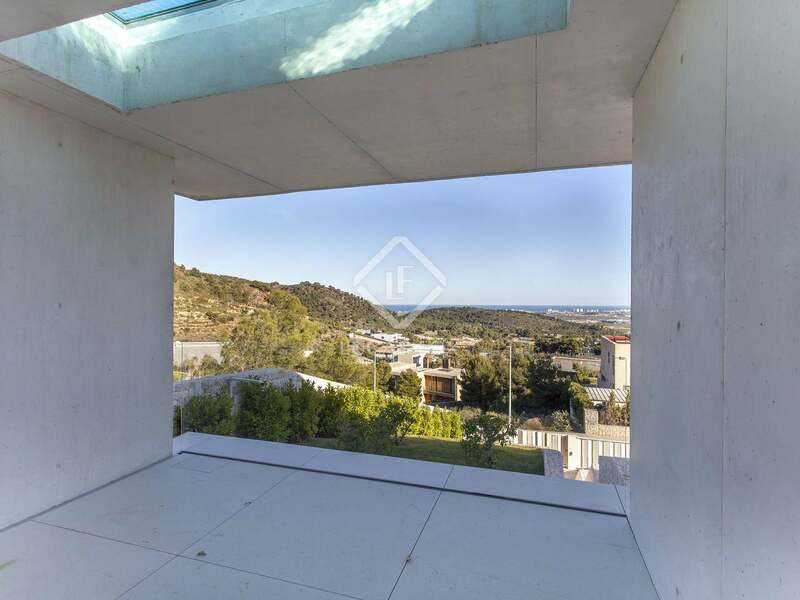 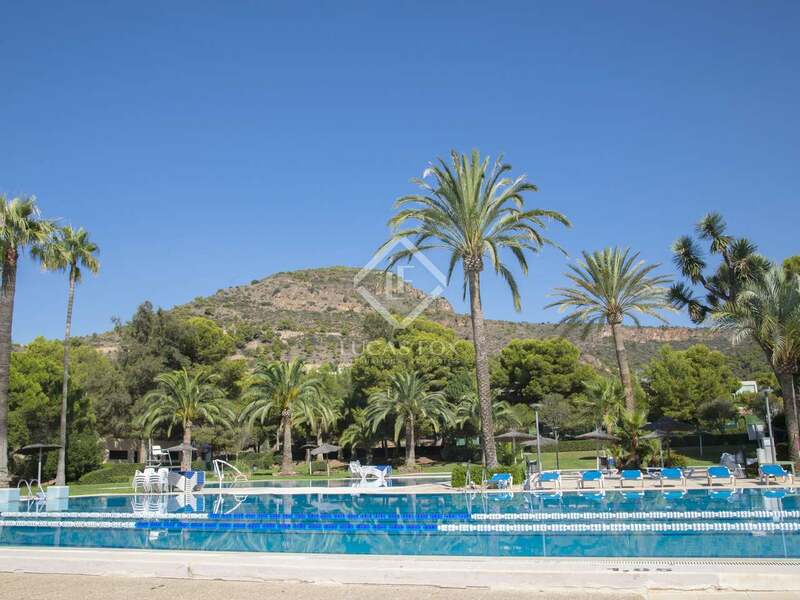 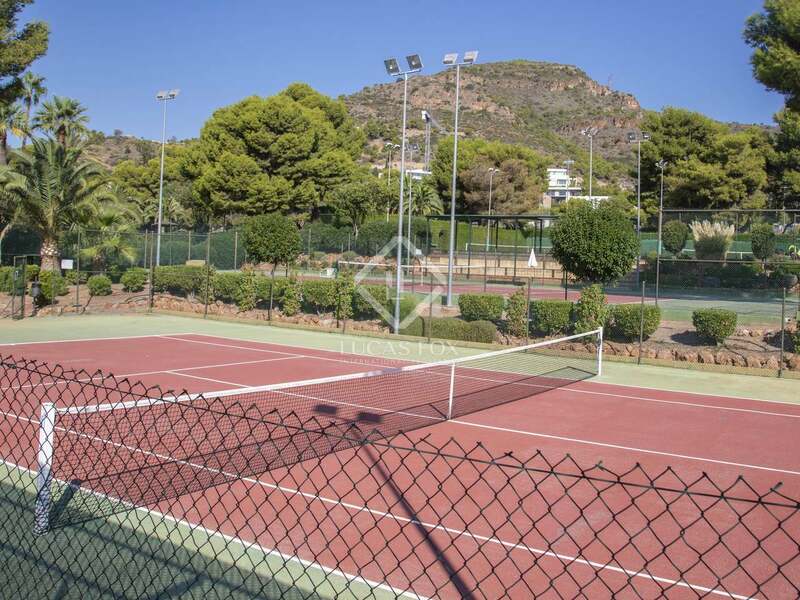 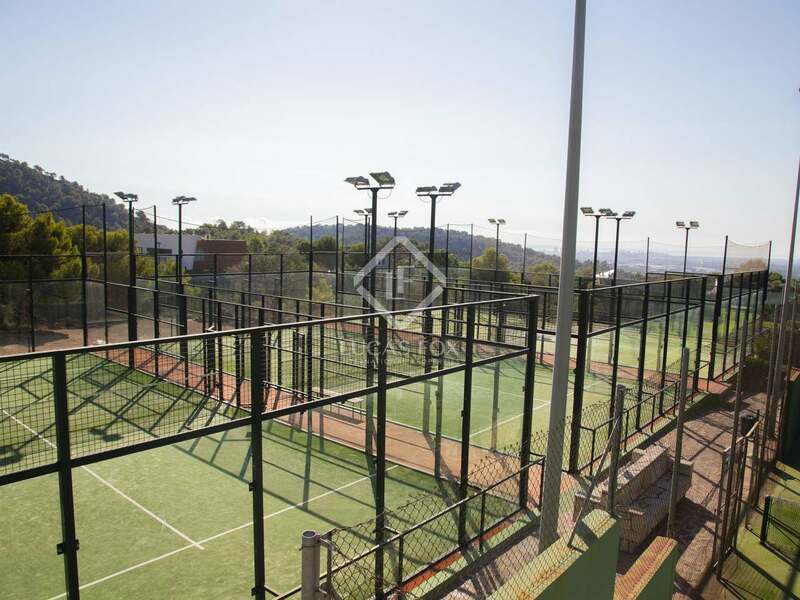 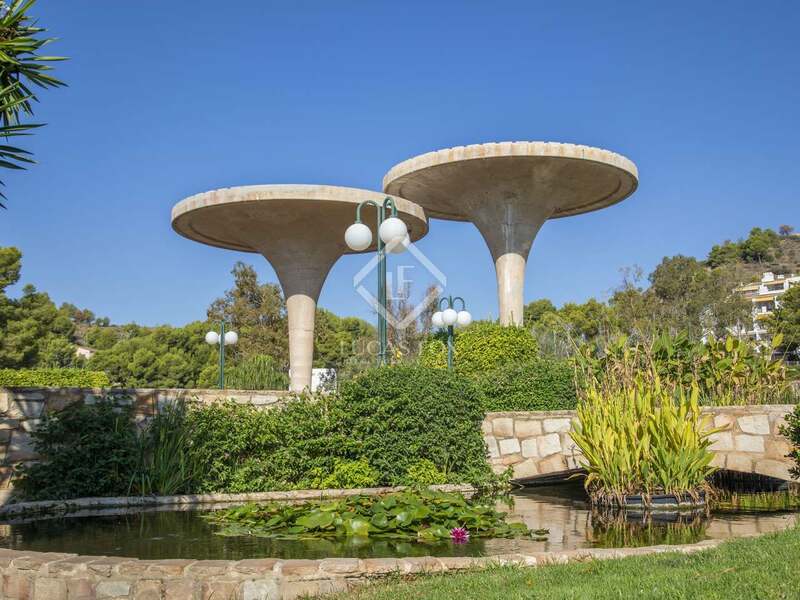 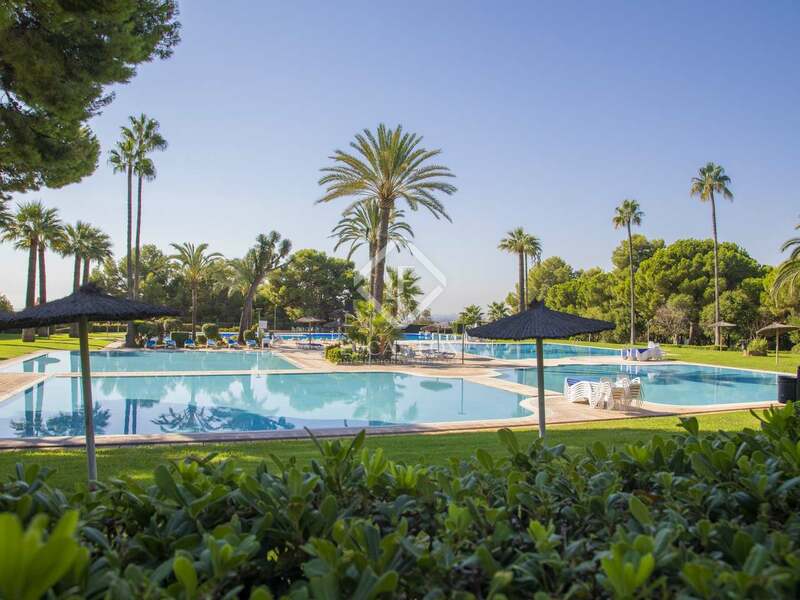 It is located on top of a hill, with the best possible position to enjoy the views over the Gulf of Valencia, in Puzol.